Short life in pictures.....I am sure the neighbors are loving our continued downward spiral into redneckdom! We are just trying to grow some things and educate the kids. It's all in the name of the kids but it is a trite tacky. I didn't know how else to string up my peas so I used 'string'! 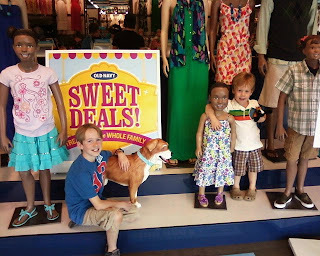 I am still waiting for my check from Old Navy for this advertising campaign! How cute is this guy? Waiting for soccer a few Saturdays ago.